The Internet of what? The internet of things is a term you may have heard a lot recently. It features heavily in discussions about our future – and, increasingly, our present. But what is it? This is a simple guide to the term, the impact it’s set to have, and how it might change your life. The ‘smart fridge’ dominates media discussions. A fridge that could let you know when you’re running out of something, write a shopping list, or alert you if something has gone out of date. But, in theory, anything from a jet engine, to a washing machine could be connected. Connected devices can be controlled remotely – think: adjusting your heating via an app – and can gather useful data. According to SAP, the number of connected devices is set to exceed 50 billion by 2020. 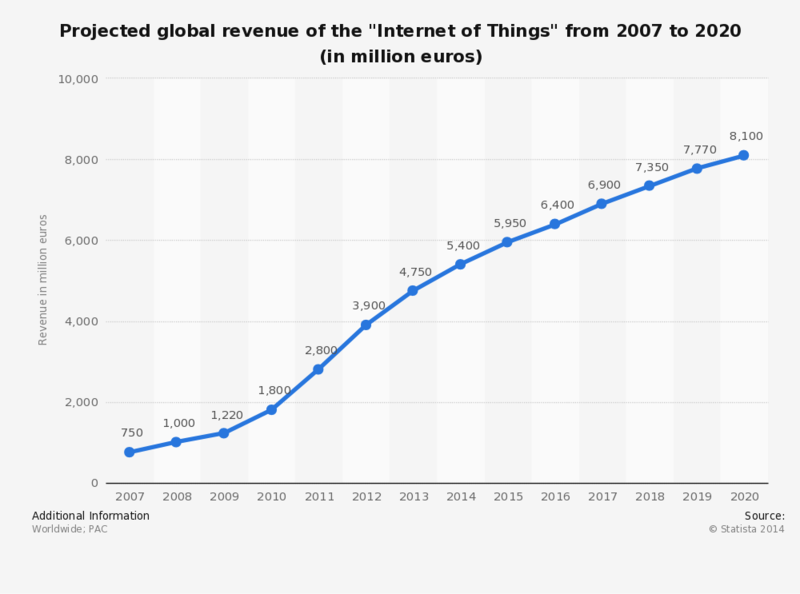 Revenue for the providers of IoT services is also growing rapidly, as this chart shows. The IoT is about much more than connecting multiple objects in your home to the internet. 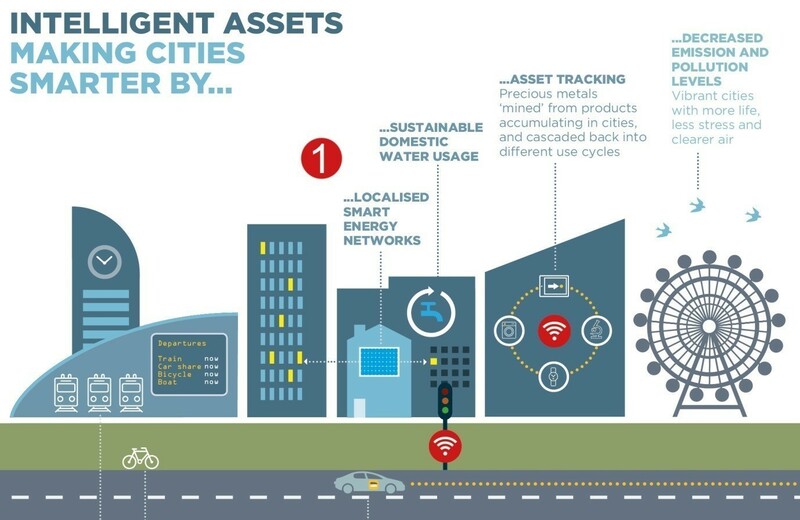 As the World Economic Forum’s Intelligent Assets: unlocking the circular economy potential report has highlighted, the IoT has the potential to transform entire cities. Sensors, combined with smart phones, will allow for more efficient energy networks (across cities and in your home), reduced congestion and improved transport, as well as recyclable, multi-use buildings. Houses, offices, factories and public buildings could all generate electricity from renewable sources. Sensors would then coordinate the distribution and storage of this power, making whole systems cleaner, more efficient and more stable. 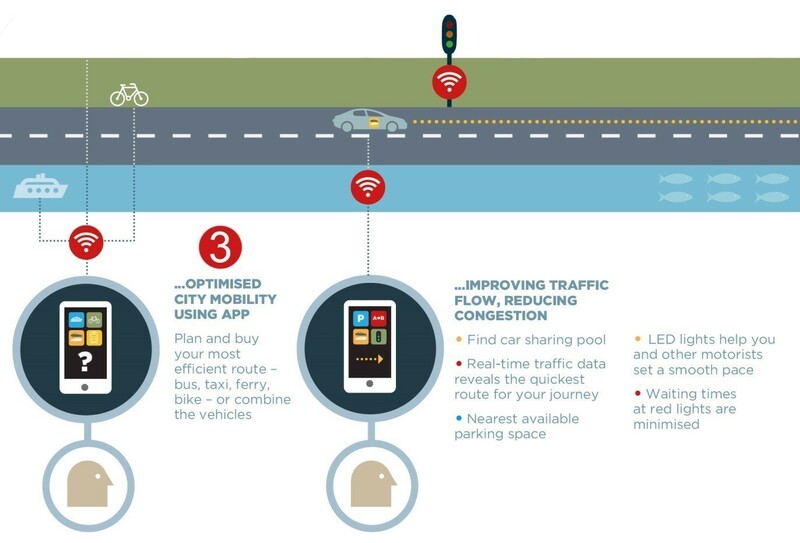 Smart cities could also make your journey to and from work much easier. Real-time traffic data, gathered from sensors, could reduce journey times. Mobile parking apps will make finding a space much easier, while smart street lights would light your way home. Connected cars are set to be a major part of the IoT. Gartner forecasts that by 2020 there will be more than 250 million connected vehicles on the road. Live traffic and parking information, real-time navigation, and automated driving could all become a reality as connectivity spreads. 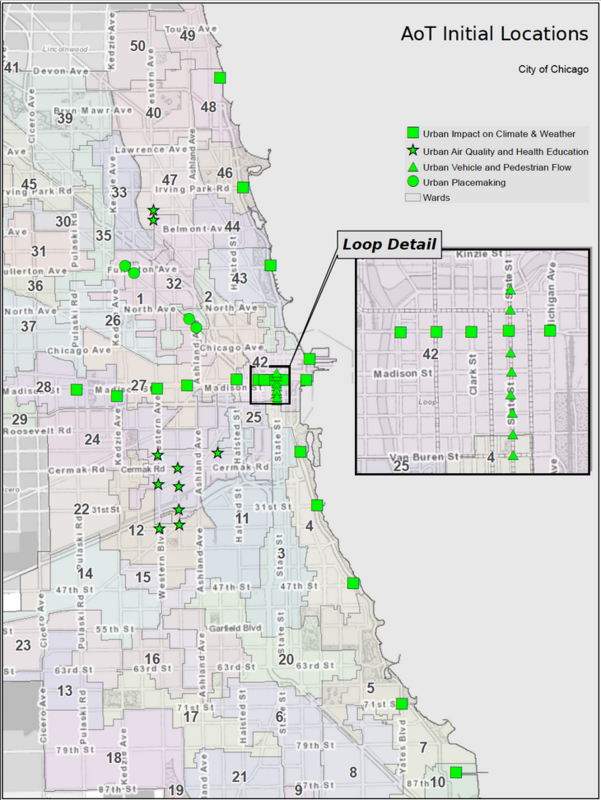 The installation of 42 ‘nodes’ – data collection boxes – is set to begin this summer in Chicago. By 2018, the Array of Things project hopes to have installed 500 across the city. This map shows the location of the original 42 nodes, which will gather data on topics from air quality to traffic volume. All this data will be made available to the public. It will provide real-time, location-specific information about Chicago’s “environment, infrastructure and activity”, according to Array of Things. The IoT has the potential to make our lives better. More efficient heating systems could save us money, transport apps could save us time, and new electrical grid systems could help save the planet. So it’s all great then? Not quite. There are numerous security concerns around having so many connected devices. Each connected device in theory becomes a risk, and a possible target for hackers. Many of these devices contain a lot of personal information and data. Consider a smart electricity meter. It knows your electricity use and typical times you’re at home. All of this could be available to a hacker. If a whole city is connected, the risk becomes much greater. In this World Economic Forum video, Lorrie Cranor, Director of Carnegie Mellon University’s CyLab Usable Privacy and Security Laboratory, explores the threat IoT could pose to our privacy. She also looks at what we can do about it. “In our smart homes we want our fridge to remind us to buy more butter at the store but we don’t want it to tell our health insurers,” she says. What does the internet of things mean for our personal privacy?